In Krakow, we will be staying in Hotel Grodek. One of the most luxurious, intimate hotels in Krakow, the boutique Grodek Hotel is located in the center of the Old Town, on a quiet street, away from the traffic. It adjoins the medieval convent of the Dominican nuns, which lends an evocative historical dimension to the ensemble. Every room in the hotel has a unique character and design, from the Renaissance influences to the contemporary flair. All rooms are air-conditioned, and the guests are welcome to relax in the sauna, in the library or amidst the fragrant flowers of the winter garden. The hotel's cellars house a small archeological museum. Hotel Grodek offers 23 individually decorated rooms with satellite television, refrigerators and coffee/tea makers. Modern bathrooms feature luxury amenities like thick terry bathrobes, slippers and hair dryers. The Wi-Fi Internet is provided to the guests free of charge. Complementary bottled water is delivered daily to the room. 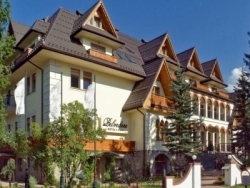 In Zakopane, we will be staying in 4 star Belvedere Resort and Spa. Hotel Belvedere is a luxury mountain resort and spa hotel, with stunning views of the Sleeping Giant Mountain Range and the Tatra Mountains. The secluded location allows for quick access to the center of town and to the most beautiful valleys leading up to the heart of the mountains. The hotel is surrounded by pine and birch forests, carpeted with flowers and cut with mossy paths, ideal for walks - alone or with a friend. The hotel has a swimming pool, sauna, spa, fitness center and bowling alley. There are two restaurants and two bars in the hotel, as well as Viennese pastry and coffee shop. The hotel's architecture is modeled on mountain chalets and the classy interiors refer to the glamor of the 1920s. All rooms are well appointed, some with fireplaces and pinewood walls. Bathrooms are equipped with luxury amenities, and the daily newspaper and bottled water are delivered to the rooms every morning. The hotel offers free WiFi service for its guests.